Peaced Together runs for ten weeks and up to ten women can attend each course. A Peaced Together trainer facilitates each two hour session. To ensure everyone can benefit fully from Peaced Together, it is helpful if each person can commit to attending the whole course. 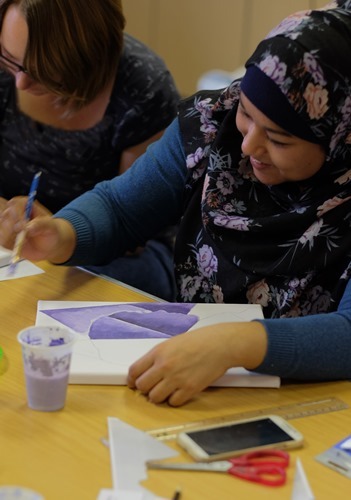 At each session, we use the time to look at a particular theme, discuss our experiences and get stuck into the craft activity. The atmosphere is relaxed and friendly, and there are volunteers on hand to offer help with craft activities if needed. At the beginning of the course, participants are given a ‘Scrapbook Journal’ to help them creatively process thoughts and ideas from the sessions. The Scrapbook Journal is a personal project so each participant can decide whether to share it with others. At the end of each course we hold a celebration and exhibition of the work that has been produced and participants are presented with a certificate. Peaced Together Enterprise is a friendly craft-selling collective which provides an opportunity for women to continue using their creativity and developing craft skills beyond the end of the course.